Instrumental insemination continues to gain use and recognition. This has been a worldwide trend for years, as the technique provides a means to control mating. Controlled mating is essential to advance selective breeding. In addition, research and breeding experiments are facilitated. The techniques are perfected – many experts and scientists have contributed over the past 90 years – ensuring success. Numerous studies have demonstrated that artificially inseminated queen bees have equal performance compared to naturally mated queen bees. 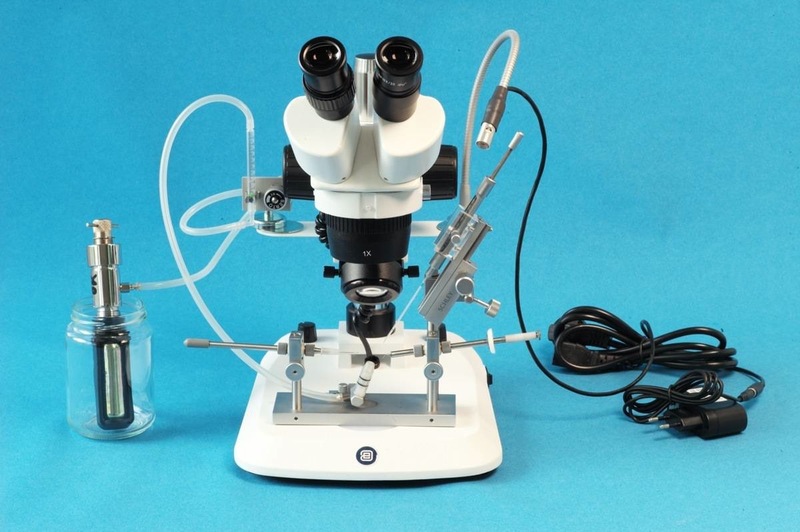 The necessary equipment consists of the insemination device, a syringe for the sperm transfer, a stereomicroscope, a cold-light-source and the anesthetizing device to immobilizing the queen bee. The devices can either be assembled as desired, or the above complete unit can be purchased. The SCHLEY instruments featured here have been successfully used for 35 years and are constantly being updated and improved. They offer the latest technology, provide precision, smooth and acutate movements, and ease of use. The functional parts of the insemination devices being sold are identical and interchangeable. Each of the instruments offered meets expectations. The first choice for hobby apiarists as well as for farms and training schools. Yet there are still differences that cater for differing preferences. Of late, methods have also been recommended to further simplify the insemination process and work freehand using a pair of tweezers. But this is not as easy as it may seem. The current revised form combines the equipment description and catalog, and continues to provide a source of information (The German part is described in more detail). Keywords for this article artificial insemination control mating controlled mating general information insemination insemination device instrumental insemination instruments queen bees Schley equipment.